Today was the beginning of a nice stretch of weather for us, so I took advantage of it – and promptly overdid it, in my quest to get things on the right track for the upcoming season. Today I dug out twelve holes: two for the new dogwoods, ten for the new blackberry canes. When you have a hole, of course you then have to refill it, preferably with a mix of good topsoil and compost, and in the case of the trees, a handful of greensand in each as well. Out back, a twelve foot, eight inch deep trench so I can lay in the barrier for the first of the bamboo that will go in. The next step there is to get the barrier buried and then dig yet another hole to plop the bamboo down in the center of the line, to allow it to spread left and right (or north and south, if we’re talking directionally) without allowing it to spread into the neighbor’s property. I don’t really care about the neighbor one way or the other, but I’d prefer not to have to deal with them at all about runaway bamboo encroaching on their side of the fenceline. Toward the end of the day, after setting the timer to water the main front garden and the garlic, I couldn’t resist pulling weeds and stray alfalfa from the frames out front. Even though my knees and my right side where the surgeon filleted me protested, the front is entirely weed and alfalfa-free, ready for whatever I ultimately decide to plop down there. Sunday: a trip to the NOC, a short stop by the pharmacy for a prescription, and then back outside for more work: planting the aforementioned bamboo, more deep watering of the two new trees and blackberries, some touchup work on a few exposed roots of the peach and kumquat trees, and polishing off the weeding of the back garden, which has gone rather well and which is almost complete. I suppose it’s time to pull the remaining leeks from that area as well and do something with them, like cook them and eat them, since we love leeks around here. Yesterday, I finished hanging the lights in the barn and seeded a couple of flats to throw under them. Photos of that to come tomorrow…. I got kicked out of the garage. 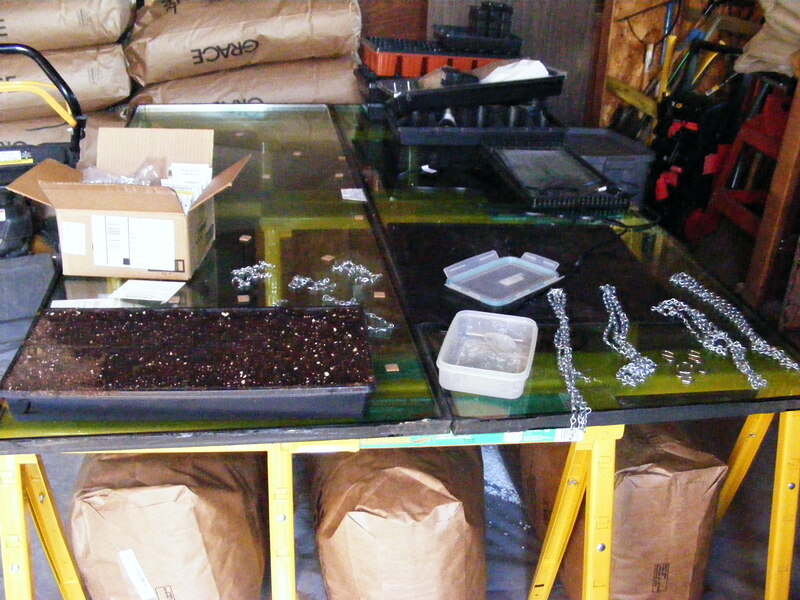 Let me rephrase: enough room was cleared in the barn through some rearranging and the removal of my brother’s motorcycle that we got two tables set up inside and one outside on the northeastern side of the barn so this year’s seed propagation will be done there instead of in the garage. This is all well and good, of course. The barn has all my material right at hand and there is more room to move around there than in the garage. The only downside is there is no direct water in the barn, so I’ll need to drag a hose in to do the watering. I think everything will be fine, as long as the local authorities don’t do heat-seeking flyovers, miss all the outside frames and activity there, and think there’s some kind of grow operation going on. To be fair, there is, or will be, one, but not the kind they may think. There is still obviously some setup to do: I need to climb up to the rafters and drive some supports for my grow lights, hang the lights, and get the flats ready for seeding. The one and only flat currently on the tables has some artichoke seed in it, to see if we can coax some to germinate. Last year’s attempt was not successful, and I’m not sure if it was because the seed was almost two years old at that point, or if through some combination of light, watering, and heat I managed to kill the process. Still, there’s nothing like the attempt, and what’s the point of doing any of it if you’re not trying new things and having a bit of fun? Another item on the list of things that desperately need to get done is polishing off the building and filling of the last row of 8 x 4 frames out back (in addition to the completion of the filling of the current row) so we’ll have somewhere to plop the babies when they’re ready to exit the barn environment and hit the real weather outside. 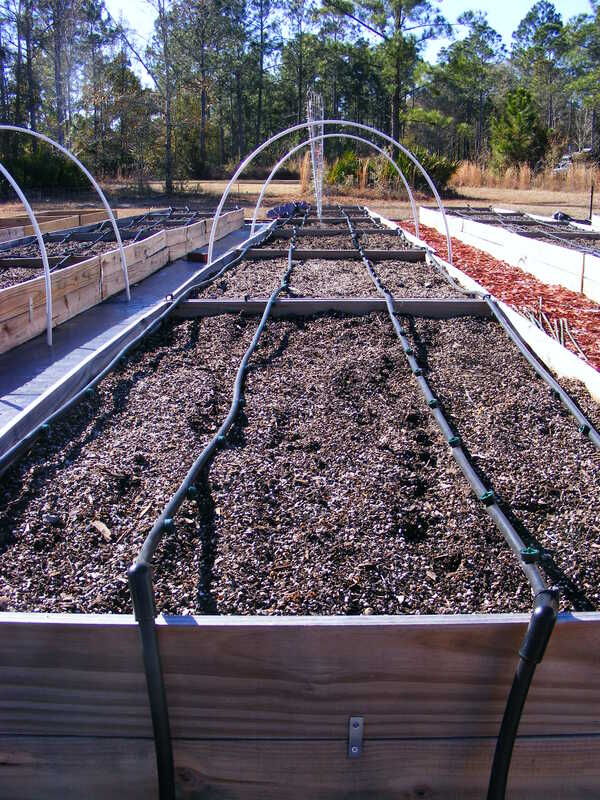 Some things – okra, the watermelons, and other larger seeded items, along with the things that don’t transplant well here, like carrots – I’ll directly sow into the frames. I’d say about 75% of the plants will be started in the barn, though, and fed doses of diluted worm poo juice to keep them going while we wait for the winter to go away. I also have trees and plants to get in the ground. I’m just hoping they can stand to hang out for a bit while the weather moderates enough to have a stretch of decent, non-freezing nights for them to get happy in their new surroundings. Quite honestly, I’m looking forward to this season in a way I haven’t over the previous few years we’ve been here. I’m not sure if it’s because of the way last year went, or because I decided to be more laid back about things in general this year – like the massive server meltdown that made for a 40 hour day last week, or bitchy/rude clients, or because I’ve come to the base thinking that if I want to do this, then I need to put a complete effort into it instead of thinking of it as a hobby that can be indulged but not tended. Whatever the case, that same optimism that grips me when I turn the pages of seed catalogs has me right now as I mentally plan layouts in the garden and then scrap them one by one, looking for the best way to manage the space I have and the timing of when various things will be ready for going in to the garden and then harvested – and thus be ready to be replaced by something else. The circle of life on the farm has me, and the thought of escape has not been one I’ve entertained. At some point last year, we decided that in addition to keeping chickens as layers, we’d get some to raise for meat. Me, I’m all for it, as I’m very comfortable knowing where my food comes from and how it manages to get from the barnyard to the store (or, in our case, the farmers from whom we purchase our meats) to my pots and pans and into my belly (not that I eat a whole lot these days). Still, I’m perfectly fine with raising and processing and freezing our own birds, and I thought other people in the family were as well, even if they didn’t actually participate in the processing portion of it. Now, though, my mom is questioning whether she could eat an animal that we raised, so it appears we’re just down to me on the farm to human really, really local food chain. Instead of bringing to the ranch a group of chicks to be raised for meat, I ordered eight chicks destined to live out their lives laying eggs instead. Worst case, figuring a 50% loss in shipping, we wind up with four birds. Best case, we wind up with eight, who should lay enough for us and extended family. They’re due for delivery in mid-March right around my birthday, which gives us about a month to get rid of the current girls and clean everything up for a group of peeping fuzzballs. In a strange twist, it appears that the oldest of the girls, who had not been laying at all, has started laying once more, as if she’s on to our nefarious plan to give away this group for free to anyone who wants to come get them (most likely for the stewpot, since they’re older, and erratic layers). If anyone local to the greater Jax area wants them, let me know. No more mutt chickens, though. The group of replacements we got last year are of indeterminate heritage, and although docile, not tremendously consistent in laying – the very reason they have to be moved out for more productive birds. I ordered four each of Red Star and Delaware day old chicks, a good mix of medium to high production layers, and both breeds are friendly, docile, and easy to manage. Maybe next time around I can convince everyone that having our own meat birds is nothing to shudder about. It doesn’t look like much, I’ll grant you that. But this is the first volley of spring planting: parsnips and carrots. Parsnip seed is soaked overnight, and is a royal pain to sow by hand. But sow I did, four rows worth of a vegetable that won’t be harvested for many months. The carrot seed was pelleted, so slightly easier to deal with, and is a short, 60-day variety that will probably be closer to 75 given the weird weather. Still, it’s nice to get back out and grub around in the dirt, clearing weeds from the frame and envisioning what is to come. It’s true that every place in the world has its own seasonality. For some reason, many people, when they think of Florida, think that all of Florida is exactly the same, and that there is never a real winter here. Northern parts of the state, while not reaching the epic lows of other places, do have their share of frigid weather (as do other parts of the state – anyone who has ever heard about risks to the citrus crops will understand this is the case). We live with it because our winter is generally blissfully short, and when spring comes, it rapidly passes through like so many birds migrating through on their way to other places: some years, true “spring” weather can be measured in weeks, rather than months as in other places. Knowing that winter is fleeting and spring just a bit less so is a tad frustrating for those of us impatient to get seed flats started so they can be planted out to take full advantage of the long growing season we have here. Start too early, and the young plants go leggy and bound in their pots, awaiting prime weather. Start too late, and there is no proper spring period to harden them off before summer comes blazing in. Last year, I started too early, but managed to work with the plants to keep them in shape until they could be safely planted out, and if our season here had not been interrupted by medical issues, I think we could have had quite the bounty. I’m trying not to make that same mistake this year, and forcing myself to wait until February to begin the flats under the lights in the barn. That’s made difficult when the seeds and plants start arriving, mocking the farmer champing at the bit to get moving. 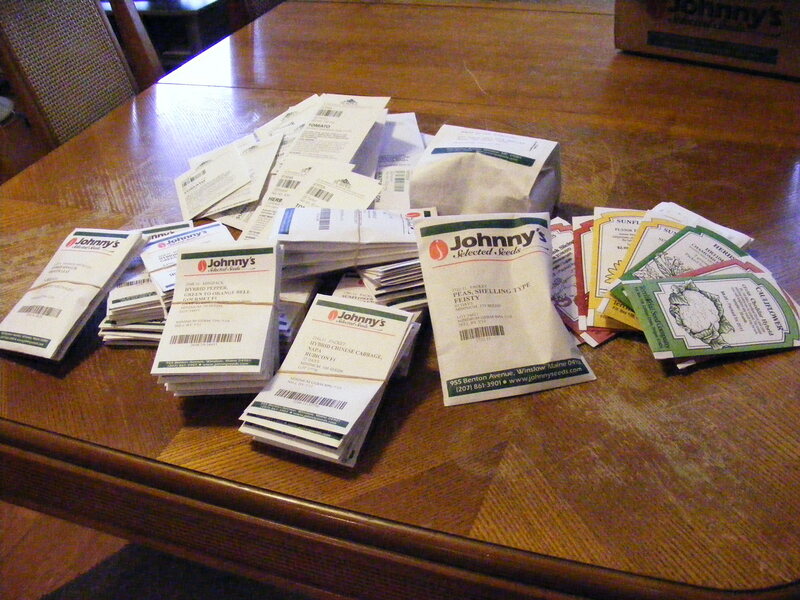 This is the first round of received seed from the massive order I placed: Johnny’s, Burpee, and Territorial. The other day, I received plants from Willis Orchard, just in time for another untropical few days and nights: four types of bamboo, a couple of dogwood trees (“How can you tell a dogwood apart from other trees? By its bark, yuk yuk.”), and some blackberry canes to replace the ones the dogs ran down (long story) and the ones the redneck neighbor killed by spraying some kind of horrible chemical along our common fenceline. I’m still awaiting shipments from Fedco, Bountiful, Shumway, Gurney’s, and Vesey’s, as well as backordered and separately shipping items from the first three through the door. As you might imagine, we’re planning a big year here. There are still some things to complete, like building and filling the final row of frames for the rear garden, and I have almost convinced myself to redo the irrigation lines in all three gardens, but I have no doubt that we’ll be ready when the time comes to plant out the babies as spring makes an appearance at the ranch. 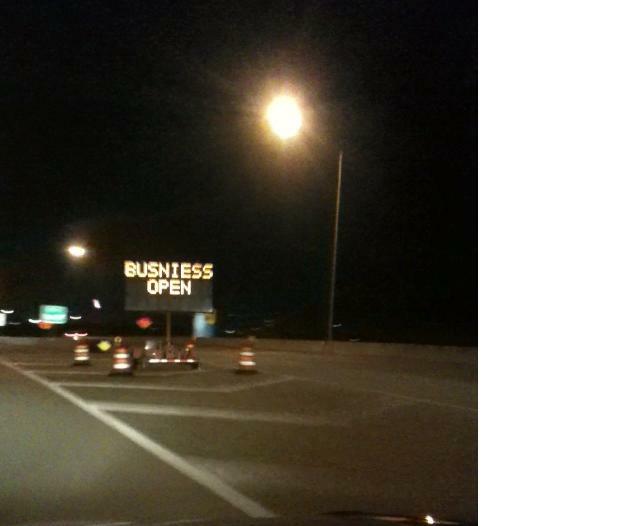 The other day, I posted a photo of an electronic sign near a construction zone in the area that has had the same misspelling in place for months. Today, I had occasion to once again travel that way en route to the NOC to rack a couple more servers, and amazingly enough, the spelling had been fixed at some point in the last three days. Congratulations, sign-fixer, whoever you may be. I know our clients seem to think we have ESP or other telekinetic powers sometimes – perhaps they’re on to something there. Or maybe a crew leader finally got tired of reading the same flashing misspelled sign I did. This sign has been in place for at least three months now. What the heck is a "busniess"? It’s at the San Marco exit, and presumably is to inform everyone that things are still open even though they’re tearing up the roads in the area. We all know what it really means, but it hasn’t occurred to anyone responsible for the sign and/or construction in the area to correct this after months of having this huge fail seen by however many thousands upon thousands of commuters (and tourists!) traveling along the route on a daily basis? It’s also a bit troubling that someone had to program this, and that same someone is likely working on the crew in some capacity. Hopefully it doesn’t involve safety-related calculations of any sort that they have to write down and give to other people. It’s always nice to have new toys. That was a test done with the PlantCam, a time-lapse cam I picked up because I’ve always found time-lapse photography fascinating. This is a very simple version of more extensive setups, of course, but really all I want is to be able to capture certain things without a giant, elaborate system – because of course, most of my attention will be focused on the actual growing and tending of things, not with fiddling with equipment. I get enough of that sort of activity in my day job. I decided after the ice test to try capturing the sunset. If you watch closely, you’ll see a bird appear and disappear from one of the tree limbs. The first video is composed of images taken every minute for right around an hour. The second is from images taken every five minutes for almost two hours. Both were put together with Windows MovieMaker rather than the onboard video converter, as it appears the onboard converter will only do low-res output. I can’t wait to put this among the seed flats and then out in the garden proper, especially on something like okra, which can grow insanely quickly. Who knows, maybe we’ll have several cams scattered about, capturing life on the ranch when we’re not looking.